You tend to love a good adventure, but you don't want to get your hands dirty. As the ship's bird, you can tag along and enjoy the booty of the plunder without having to leave a shoulder. Get ready to squawk across the great seas in this Adult Parrot Costume. They say “birds of a feather flock together,” so team up with a pirate friend or enjoy flying solo at the big Halloween party—either way you’re bound to be a crowd favorite. Partygoers are likely to feed you more than a few crackers while you’re dressed in this colorful getup, and that is a-ok by you—those long sea voyages can leave a bird mighty hungry. Now that you have your sea legs, you’re ready to regale the crowd with tales from distant isles and hard-won treasure…in your best parrot squawk, of course. There was that time when you helped save the whole ship from that rogue Captain Beardo—don’t forget that story. You won’t, parrots are highly intelligent creatures (some are even able to associate actual words with meanings and form simple sentences!). 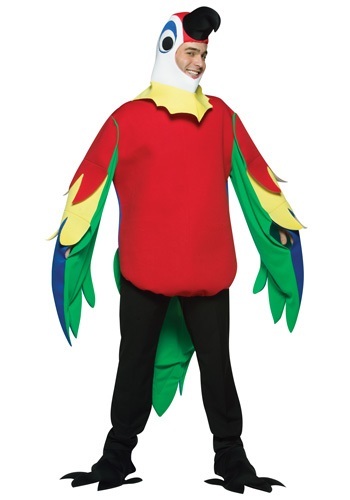 And you sure seem smart, having opted for this glee-inducing costume. The foam body and attached sleeves with faux feathers provide the vibrant base of this look, while black parrot feet shoe covers and a beaked headpiece create a truly remarkable ensemble worthy of repeating over and over and over. While we don’t recommend sitting on your pirate pal’s shoulder all night, we do suggest hovering near him to ensure your clever counsel is as easy to seek out as the north star.